Deanna takes a moment to survey Alexandria. The devastation is heart breaking. She overhears Michonne telling Maggie what happened to Glenn. 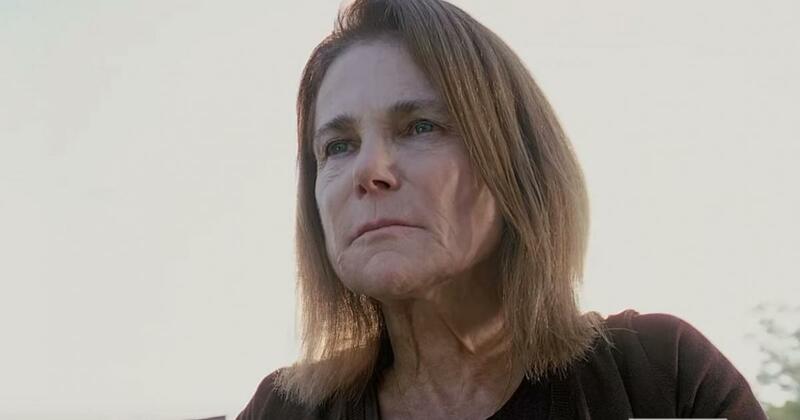 Deanna then hears Rick screaming to open the gate. Deanna is horrified to see the herd of walkers closing in on Rick. Michonne and Morgan race to the gate and let Rick inside just in the nick of time. The walkers now have Alexandria surrounded. The plan failed, now they have to find another way to solve this problem. 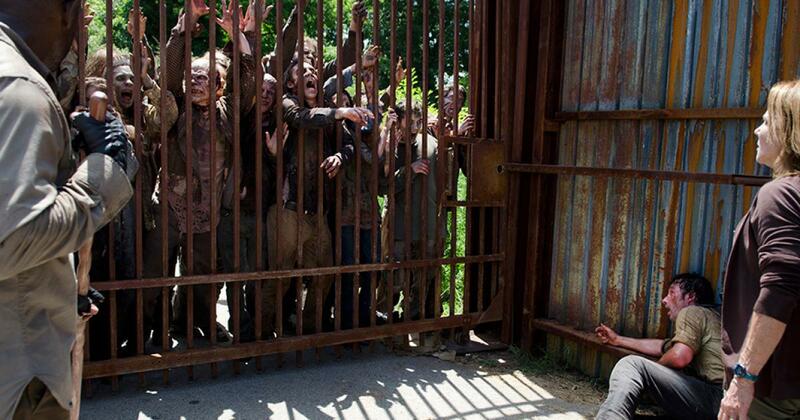 Some citizens are crying while others are trying to build up defenses to keep the walkers at bay. Rick wants everyone to stay inside their homes and be as quiet as possible. He hopes that eventually the walkers will move on. Aaron agrees with Rick. He also recounts how he and Daryl were out on a run. He wanted to scavenge for supplies. Daryl wanted to look for people but went along with Aaron’s plan. As a result, he lost his pack. One of the Wolves found the pack and used the information to attack Alexandria. Aaron wants to make it up to the people for his mistake. Morale is low everywhere. Deanna is so depressed she can’t bring herself to lead the others. Some of the citizens are trying to raid the food supply as Olivia tries to stop them. Spencer steps up and reminds them they have to band together if they’re going to survive. Aaron strolls through the town as he spots Maggie preparing to leave. He wants to help her and offers to show her a safe way to leave the town. Meanwhile, Deanna snaps out of her trance and draws plans to rebuild Alexandria. She finds Spencer drunk in the kitchen. She’s shocked to discover he stole food from the pantry. Spencer blames her for his brother and father’s deaths. He blames her for everything that’s happened. Jesse takes a walk around the town to clear her head. She soon sees a walker inside one of the homes. It’s a woman who came back after slashing her wrists. Other people hear the commotion and come to investigate. Jesse knows they can’t just hide anymore. The world is dangerous and they need to fight. The speech gives Denise the determination she needs to save Scott. His leg is infected and he could die if something isn’t done soon. She finds some information in a medical book to use a syringe to drain the pus out of his injured leg. It works and he begins to stabilize. Aaron shows Maggie a way out of Alexandria. He shows her an entrance to the sewers. 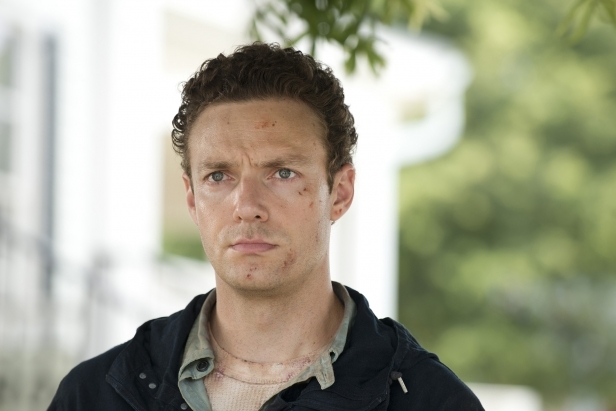 Although Maggie objects, Aaron is determined to help her. Maggie wants to know for sure if Glenn is alive or dead. They come across a couple of walkers. They both barely survive. Maggie insists that Aaron turn back but he won’t leave her. They come to a gate. Aaron prepares to open the gate. Maggie breaks down crying and tells Aaron that she’s pregnant. She wants to see Glenn again. However, she’s ready to accept the possibility that he’s gone and she’ll never see him again. She’s not ready to risk Aaron’s life to save Glenn’s life. Deanna contines her stroll through Alexandria. Suddenly, a walker appears and tries to attack her. She manages to hold it off until Rick comes and kills it. Deanna wants to live, she wants Alexandria to live. She wants Rick to be the leader. Deanna may have been depressed earlier. She’s ready now to fight back. Deanna built Alexandria to be a safe place for her people. She’s not letting it go without a fight. Rick: You can hear it. Some of you saw it. They got back here, half of them. Still enough to surround us 20 deep. Look, I know you’re scared. You haven’t seen anything like this. You haven’t been through anything like this. But we’re safe for now. The panel the truck hit seems intact. We reinforced it just in case. Either way, the wall’s gonna hold together. Can you? Spencer: (after catching some citizens trying to steal food) Doing this now will start us down a road where nothing matters. Where no one else matters. And then we’ll all look back at this moment right now as when we destroyed this place. Jesse: I used to not want to see the way things are. It’s not that I couldn’t. It’s that I didn’t want to. But this is what life looks like now. We have to see it. We have to fight it. If we don’t fight, we die. We all know what’s coming. The walkers will get in and attack the people inside. The attack will come and the Alexandrians need to be ready. I’m not sure how it’ll end. Can the Alexandrians survive the attack? If they do, will they stay or flee? I have no idea where else they could go. No matter how the fight ends, I don’t think it’ll have a happy ending. The Glenn story line needs to be resolved. I get the writers are building up suspense. But they shouldn’t take this long. Glenn is one of my favorite characters so I hope he’s alive. If he’s alive, he’d better have one hell of a story to tell. Maggie’s pregnant so I hope Glenn is able to come back to her. Deanna is coming around and her people will her strength to overcome this nightmare.